This week’s Lhakar Diaries post stems from a very odd dream I had recently which led me to think about my past life. I won’t write what happened in the dream, but I will tell you that it led me to think about the good ol’ days working on Parliament Hill in the Canadian capital. While I was attending university in Ottawa, I was fortunate enough to work in the office of the Hon. Senator Consiglio Di Nino for nearly two years. Senator Di Nino is a huge Tibet supporter who has worked tirelessly for the Tibetan people for over two decades after having visited Tibet in 1990 as a tourist and directly hearing the pleas of the Tibetan people, including receiving a written plea by a Tibetan which he hung on the wall in our office. The knowledge I gained working on the Hill was invaluable and my work mostly surrounded the parliamentary group that the Senator chaired, Parliamentary Friends of Tibet; an all-party group of MPs and Senators, which seeks to strengthen Canadian government support for Tibet, and works to be the voice for Canadian support for Tibet in Parliament and government. While I met so many incredible people I never would have otherwise – including His Holiness the Dalai Lama, as well as many Tibetan and Canadian politicians – and learned and took away so much from that experience, I think one of the more concrete things I took away from my time on the Hill was that lawmakers in our country ARE speaking out for Tibetans, we just need to do our part as Tibetans and Tibet supporters to ask them to take action, aka lobby for Tibet. Mr. Speaker, I am very proud to say that I participated today in the commemoration of the 52nd anniversary of the uprising of the Tibetan people in Lhasa, organized by the association Students for a Free Tibet. Those events in Lhasa were followed by China’s repressive measures, forcing the Dalai Lama, the spiritual and political leader of Tibetans, to seek exile in India. According to the Tibetan government in exile, these events resulted in the deaths of 87,000 Tibetans who were victims of their religious convictions and their national pride. For 52 years now, Tibet has tried unsuccessfully to regain some measure of autonomy. The cultural fabric of the “roof of the world” is weakening. Tibet’s history books have been rewritten and the Tibetan language is no longer taught in secondary schools. It is time to adopt a comprehensive approach that takes into account the interests of all parties involved, rather than taking one side or the other, so that Tibet may achieve real autonomy within China, as requested by the Dalai Lama. Mr. Speaker, I rise today to request that all members here take note of the plight of Tibetan environmental philanthropist Karma Samdrup. Mr. Samdrup is imprisoned by the Chinese government in Tibet on what Human Rights Watch says are dated and “trumped up charges”. Mr. Samdrup defended his brothers and was jailed when they challenged local officials in an environmental dispute. There are credible reports that Mr. Samdrup has been tortured during his imprisonment. In 2006, Mr. Samdrup was CCTV’s philanthropist of the year in China and today he is one of several cases of human rights abuse that concern Tibetan Canadians who tomorrow are marking the 52nd anniversary of Tibetan Uprising Day when they lost their independence. Members of Mr. Samdrup’s family, who live in Toronto, are among the many people looking to us. It is vital that we as parliamentarians are vigilant and remain consistent in our support of human rights no matter where they are threatened. We call on China to treat Mr. Samdrup with all the respect his human rights deserve. Mr. Speaker, March 10 marks the 51st anniversary of the Tibetan uprising against the systematic, brutal oppression Tibet suffered at the hands of Chinese authorities. That is also when the Dalai Lama and other groups of Tibetans fled to India. This anniversary commemorates the thousands of Tibetans who died that day, as well as the thousands of Tibetan martyrs sent to forced labour camps in China. After more than half a century, the preservation of Tibetan culture and heritage is threatened. Little has changed when it comes to human rights. Unfortunately, Tibetans are not likely to find the peace and tranquillity they once knew any time soon. Together, let us recognize the strength of these people, who have not lost hope that their government in exile will find the common ground that will allow them to preserve their culture and religion. The Government of Canada has a moral obligation to defend Tibet’s right to regional autonomy and must urge the international community to push for substantive negotiations between the Chinese government and the Dalai Lama. During his current trip to China, will the Prime Minister specifically raise this issue with the Chinese government and call for Mr. Wangchen’s release? Mr. Speaker, my second petition is from many Yukoners who have noted that for 50 years the Chinese government has oppressed the people of Tibet. The government promised to improve human rights if it were given the right to host the Olympics, but the brutality continues. Since 1950, 1.2 million Tibetans have been killed by the Chinese government. Mr. Speaker, human rights in China have not improved as a result of being granted the 2008 Olympic Games. In fact, they have become worse. The continuing crackdown on Tibet by the Chinese government is an egregious violation of human rights. 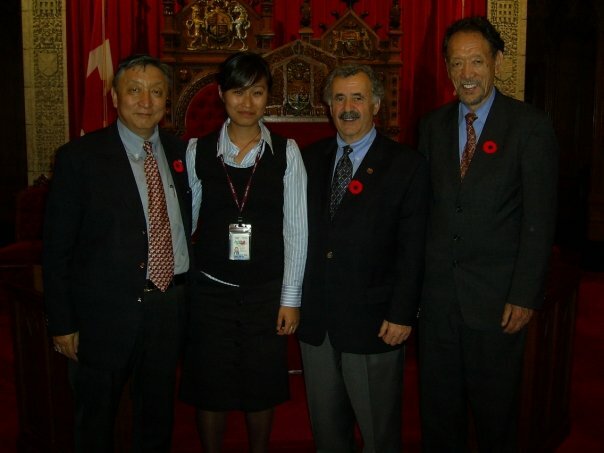 The petitioners call upon Parliament to request that all Canadian politicians boycott the 2008 Summer Games in Beijing. Therefore, the petitioners call upon the Government of Canada to negotiate honestly and sincerely with the Dalai Lama. They also ask that the Prime Minister openly and fearlessly confront China’s tyrannical opposition to human and civil rights, freedom and dignity of the Tibetan people. Mr. Speaker, today is the 18th birthday of Tibet’s Panchen Lama. He is the second most important religious leader for the Tibetan people after His Holiness the Dalai Lama. He also became the youngest political prisoner in the world when, in 1995 at the age of five, he and his parents were arrested by Chinese authorities. His only crime was being chosen by the Dalai Lama to become a great spiritual leader for the people of Tibet. The Dalai Lama received honorary Canadian citizenship after a unanimously accepted motion that I presented here in the House June 22, 2006. That motion and subsequent citizenship recognizes, among other things, the Dalai Lama’s relentless commitment to non-violent conflict resolution and tireless work for genuine autonomy for the Tibetan people within China. Despite the Dalai Lama’s best efforts for reconciliation, the Tibetan people continue to be denied their basic rights. I call on the government of China to deal in good faith with the Tibetan people and the Dalai Lama, and release the Panchen Lama and his family immediately. Mr. Speaker, it is reported that Chinese border guards fired on a group of about 70 unarmed Tibetans who were attempting to cross the border from China into Nepal. A 17-year-old nun was killed. The guards also reportedly took some Tibetans into custody, mostly children aged six to eight. Could the Minister of Foreign Affairs tell the House what representation has been made to the Chinese government and what measures are being taken to have these children returned to their families? Mr. Speaker, around the world, political conflicts are rife with violence, but the Tibetan people, under the guidance of His Holiness the Dalai Lama, continue their strict adherence to the principles of non-violent conflict resolution as they seek to resolve the half century old Tibetan issue. With five rounds of dialogue completed since 2002 between his envoys and Beijing, there is renewed optimism that a resolution on the Tibetan issue is finally possible. Tibet represents the ultimate test for the future of peaceful dialogue and reconciliation. A peaceful resolution to the Tibetan issue prior to the 2008 Beijing Olympics would, therefore, be the perfect gift to His Holiness, to the Tibetan people, but also to the Chinese people and the world community. Non-violent conflict resolution is or should be a core value for Canadians. Therefore, it is essential for Canada to play a role. His Holiness, who is now 71 years old, has had to spend the majority of his life in exile. He deserves our support to return home, along with the exiled Tibetan community. There are many more where these came from, but hopefully this will trigger some curiosity as to what lawmakers in your country have said about Tibet, and maybe even move you to lobby for Tibet. You can usually find this information in the Hansard of the government proceedings online. For Canada, you can find them here. I think what people always seem to forget is that unlike in China, in democratic societies politicians are supposed to be there to represent our voices and work for us, not the other way around.